The growth of community-based solar projects has sprung from customer interest and community benefit, but the lofty goals of these projects must be backed by smart and innovative financing so they continue to grow. 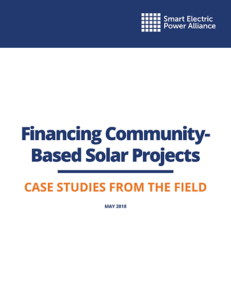 How are utilities and developers deploying strategies to reduce hard, soft and financing costs of community-based solar? The U.S. Department of Energy defines community-based solar as a photovoltaic (PV) solar installation that falls within 100 miles of its electricity offtakers and is grid connected in the same utility service territory of these offtakers. 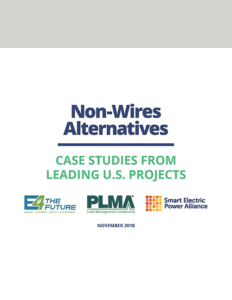 This entry was posted in Community-Scale Solar, Financing and tagged community-based solar case studies, Nebraskans for Solar NewsBlog, Smart Electric Power Alliance on May 16, 2018 by Helen Deffenbacher. Flexible subscriptions and solar-plus plans “push the envelope” of utility programs. [Smart Electric Power Alliance Utility Strategy Manager Dan] Chwastyk said the success of the Municipal Utility of Freemont, NE, SunShares program may be one version of next generation community solar. Fremont worked with SEPA on a survey to understand what customers wanted, Department of Utilities General Manager Brian Newton told Utility Dive . . . Newton said the utility decided the best way to capture the interest was to offer two kinds of subscriptions. Photo by Mike Kruger: Construction began in October on Fremont’s first solar farm, which sold out in 7 weeks and is expected to go online in December. A second solar farm already has a waiting list of 70. 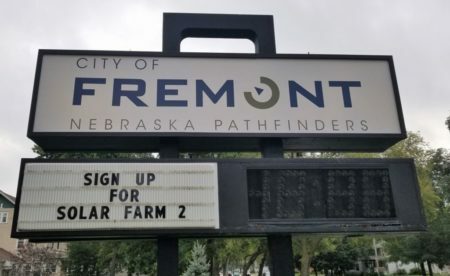 This entry was posted in Community-Scale Solar, Nebraska / Midwest News, NewsBlog and tagged City of Fremont, Fremont's innovative community solar program, Fremont's SunShares Program, Herman K. Trabish, model community solar programs, Nebraska's community solar development, Nebraskans for Solar, Smart Electric Power Alliance on October 16, 2017 by Helen Deffenbacher.